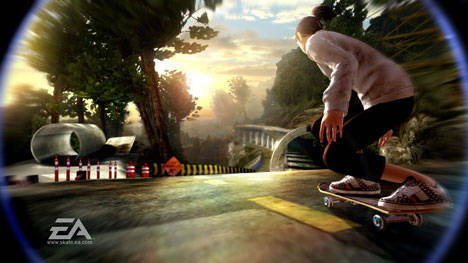 Back in August, Dyson gave us a hands-on preview of Skate 2 that summed up the new additions to the series fairly well, and so I invite you to sit down by the campfire, and let me tell you in grand detail how the game pans out. 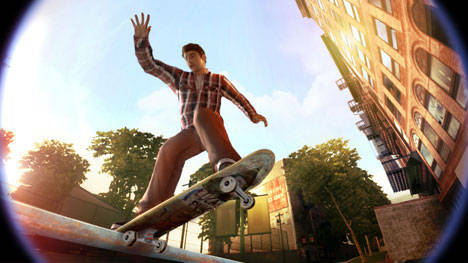 Now, before we get into this, I will admit that I'm a longtime player of Tony Hawk games, and now that Neversoft isn't working on them anymore, there's no reason why I'd want to touch the series again, so I'm more than willing to jump into Skate 2 as my new mainstay of skating games. So, without further ado, let's flip those tricks and kick it into high gear. I'll show you just how buttery this game can be. What happens when Mongo Corporation comes in and practically takes over the town? Why, they have their security guards put metal caps on everything skateable in the city, and body-check anyone on a skateboard. So, you've served your hard time in jail for what I presume was either killing someone while skating or just rocking those tricks too damn hard. So now that you're out of prison, it's time to get your cred back. Like Dyson mentioned, the game allows you to remove yourself from the board, pulling off new sorts of tricks, and if you want to, you can simply run around the world. Of course, I don't recommend doing this unless you absolutely have to. When your character gets off the board, he begins to control like some nightmare conjured up from the darkest pits of survival horror. It makes Silent Hill feel like it's Metal Gear Solid. Allowing you to get off of your skateboard and interact with the environment, though, is a fantastic touch that opens up quite a bit of opportunity. Now, you can move about bits and pieces of scenery to create opportunities for combos or reach some highly-desirable spots that were inaccessible without the aid of a ramp or something to jump up onto. Now, looking at this from my experience with Tony Hawk titles, my first sitting with the game was utterly shameful. Getting used to the controls takes a decent amount of time, especially if you're accustomed to the button-mashing that was Tony Hawk. That's not to say that the controls aren't logical -- they make a ton of sense, but it's just not what I'm used to playing. So, after mounting that hurdle, I found myself dealing with another one: the environment. As I've found, Skate 2 is not particularly easy. Unless you spend plenty of time practicing and learning all of the engine's tricks, you're going to suffer. Sometimes I wouldn't be able to land tricks because of poor timing. I'll admit, that's my fault. But too often I would run into the camera changing position to such an angle that it was impossible to see what I had lined up, a person suddenly walking in the way of my trick, or just landing at the wrong angle and being thrown from my board. Beyond this, I would run into problems with the physics of the game, resulting in some rather odd results. For example, I moved two dumpsters right next to each other in order to make it easier to jump over them both for a challenge. When the two dumpsters touched, they shot into the air as though some invisible mine was triggered, and it came down on my head. How that happened, I'd love to know. Despite those problems, running around the city is as easy as the city is gorgeous. It's rather well designed and is a rather accurate recreation of a city. They didn't skimp on any of the minor details, which can sometimes be a problem. Even the most minor of sudden elevations of terrain stop you from moving, and if you don't realize that you can't just skate over them, it'll send you flying. But, for all the minor problems in the environment, it does give you a ton of stuff to interact with and explore. The city is rather expansive, and getting around it can take quite a while if you want to just skate through. 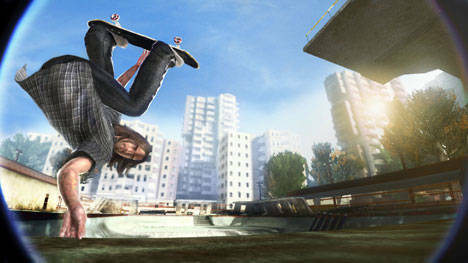 Within Skate 2 are a bunch of miniature challenges that you can try if you're not too interested in tricks, like managing to crash into a person at 25 mph and the like. One of the things that I must ask is: who the hell speaks like the characters in this game do? "Man, you can't believe how buttery I made you look!" The dialogue is filled with stereotypical skater talk, to the point where it's so bad that it's funny. Combined with that, Black Box still needs to work on its facial structures -- many of the characters have rather awkwardly shaped faces. 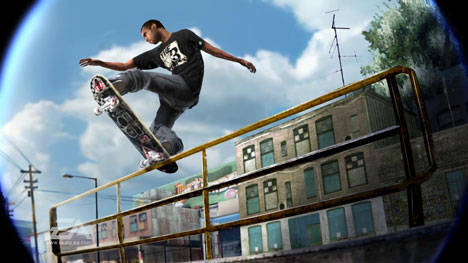 Skate 2 is going to require a serious investment of time on your part if you want to get into it. I'll be honest with that. But once you do, the game provides a rather intuitive and fun experience that's worth the work you put into it. The camera is one of the most immediate problems that needs to be fixed, but Black Box has done a good job with the title, and if they can keep making substantial improvements with each title in the series, then they'll be the undisputed frontrunners for the new generation of skating titles.